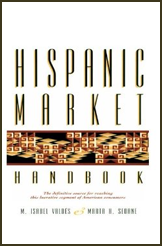 Published in 1992 by M. Isabel Valdés and Marta Sedane, the Hispanic Market Handbook was the first book that helped define U.S. Hispanic marketing. A Renaissance book published in the pre-Internet era, the Hispanic Market Handbook which discusses culture, language, media, research and strategy (like no other book in that time) – became seminal to the understanding of targeting Hispanics effectively. The Hispanic Market Handbook concludes with relevant case studies and gives the reader a historical perspective of what Hispanic marketing was like in the 1990s. Copyright - Isabel Valdés Consulting. All Rights Reserved.